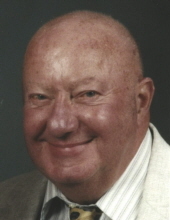 Carl W. Haase, 86, of Fostoria, passed away at 7:30 pm Saturday April 6, 2019 at his home. He was born November 13, 1932 in Fostoria to the late Charles Johan and Ethel Mae (Glick) Haase. He married Janet L. Kirian October 9, 1954 at St. Wendelin Church and she survives in Fostoria. Also surviving are five children, Chuck E. (Sandra) Haase, Swanton, Kevin L. Haase, Texas, Diane (Dennis) Garlick, Findlay, Jeff A. (Kelly) Haase, Findlay and Steven W. Haase, Arizona; 20 grandchildren; 36 great-grandchildren; two great-great-grandchildren; and three sisters, Emma Wickard, Donna Hosman and Delores Lewis all of Fostoria. He was also preceded in death by a son, Dan A. Haase; daughter, Karen Sue Seeley; three sisters, Anna Shuman, Augusta Biggs and Helen Reinhart; and two brothers, Ray and Norman Haase. Carl retired from the City of Fostoria in 1990 as the chief operator at the city’s water and waste department, after 21 years of service. He also had owned and operated the Marathon Station (1957-1962) located on the corner of South and Union Streets and began his career working with Standard Oil (1953-1969). Carl was a 1952 graduate of Fostoria High School, member of the Fostoria Moose, Sons of the American Legion, AMVETS and a life member of the Fostoria United Sportsman Club. Carl will be remembered as a hard worker, honest, very direct and had good common sense. Family and friends could count on Carl for help and advice. He loved his family and will be dearly missed. Visitation is Wednesday April 10, 2019 from 2-4 & 6-8 pm at HOENING & SON FUNERAL HOME 133 W. Tiffin St., Fostoria. A celebration of life service for Carl and his daughter Karen Sue, who passed away two months to the day, before Carl, will be Thursday April 11, 2019 at 10:30 am in HOENING & SON FUNERAL HOME with Pastor William Bentley presiding. They will be buried together in Fountain Cemetery following the service. A lunch and gathering will then take place at the funeral home. Thanks to Dr. Michael Badik, Ohioans Home HealthCare, Perrysburg and ProMedica Hospice for the fine care provided to Carl and family. To send flowers or a remembrance gift to the family of Carl W. Haase, please visit our Tribute Store. "Email Address" would like to share the life celebration of Carl W. Haase. Click on the "link" to go to share a favorite memory or leave a condolence message for the family.